B. J. Best is the author of two previous books of poetry: Birds of Wisconsin (New Rivers Press) and State Sonnets (Sunnyoutside). He is also the author of three chapbooks from Centennial Press, most recently the prose poem collection Drag: Twenty Short Poems about Smoking. He teaches at Carroll University and lives in the Wisconsin countryside with one wife, one son, three cats, and nine video game systems. Monkeybicycle: But Our Princess is in Another Castle references 60+ games from Atari, Nintendo, Playstation, and others. And though we are all seemingly steeped in the culture of these games, how would you “sell” this book to someone who isn’t familiar with or hasn’t played these games? B. J. Best: The book is intentionally written so people who have never played video games, or are even predisposed to not liking them, can still enjoy it. One reader of my manuscript was pretty unfamiliar with video games, so she was incredibly helpful in ensuring I was addressing a broader audience. I’ve also had people come to me after readings and tell me they admired the poems almost in spite of the surface subject of video games. I don’t assume any prior knowledge, beyond a few cultural touchstones: Pac-Man, Mario, and Tetris. Ultimately, the book is “about” the abstractions all good books are about: growing up, love, faith, death, and their ilk. If you’ve grown up in the digital age, or enjoy prose poems, or don’t always expect poetry to take itself deathly seriously, But Our Princess is written for you. Mb: Why use prose poetry for But Our Princess is in Another Castle instead of just prose or poetry? What is your draw to it, and what benefits do you see it having over non-hybrid forms? BJB: So much of contemporary lineated poetry is so serious, and it didn’t seem right for a book that’s about play—in terms of the games themselves, and the language used to describe them. Likewise, prose would have felt too plodding for me to capture these games which are often surreal, sparkling, and brief. I think prose poetry offered two advantages for this project. First, the form itself is playful. A lot of prose poem writers have a good sense of humor (although often a dark one). It’s simply fun to about two sentences that otherwise shouldn’t go together in standard exposition. Second, prose poems skew towards the surreal—beginning in France and Germany in the nineteenth century and continuing in the U.S. in the twentieth century by poets like Charles Simic and Russell Edson. Early video games are bizarre upon examination: Mario is a plumber who is out to defeat the turtle kingdom that overthrew the previous mushroom monarchy, and he eats mushrooms, flowers, and stars which aid him. Mario’s world has recognizable elements from our own, but taken as a whole they’re incoherent. Prose poetry seemed to be the appropriate limbo to explore the strangeness that populates these games, which extends to the strange pockets of our everyday lives. Games thrive on narrative, but you forsake that in But Our Princess is in Another Castle, flourishing instead on great bursts of poetic energy and imagery. Can you tell us a little about this seemingly contradictory approach? BJB: For earlier games, the narrative was thin—if it existed at all—and those are primarily the games the book uses, from the late ‘70s through the ‘80s. Pac-Man has no coherent story: you are a yellow mouth that must eat dots, trapped in a maze with ghosts. Even for classic games that purport to have a narrative, they were rudimentary at best, and often derivative. Space Invaders: Defeat the aliens. Donkey Kong: rescue the girl (from an ape). Galaxian: Defeat the aliens. The Legend of Zelda: rescue the girl (from a magical thief). Defender: Defeat the aliens. Super Mario Bros.: rescue the girl (from the turtle king). But the lack of a thorough narrative made the games easier to write about. For each, I took the images that had energy for me, and ignored the rest. It made it simpler to dissociate the images from the game, then use them to write a poem about a different topic. I had a much harder time doing this with more recent games, and that’s why in the book there are so few games released after 2000. The narratives of contemporary games are extensively developed, so it can be hard to wrest the game away from its original associations. Did you play each game as your wrote these? BJB: Yes. Another benefit of writing about the earlier games is that they’re short, particularly arcade games which were designed for you to die early and often, so that you’d keep feeding the machine quarters. You can play Pac-Man for about ten minutes, perhaps less, and “get” what it’s about. It’s weird to think about playing games as research, but that’s what it was: I wasn’t playing for enjoyment. Instead, I was trying to pay attention to all the disparate images a game would present, and particularly things I never noticed before: the weird purple-and-yellow skull and crossbones that balloons from your frog when you get run over by a car in Frogger, for example. I was hunting for images from these abstract and surreal games that would translate into the real world. Mb: I played Doom all the time when I was a kid. And I loved Atari’s Kaboom. What is your favorite game (if you can whittle it down)? BJB: That’s a great question. It’s weird: I played and loved these games as a teen. Then I really didn’t play them at all in my twenties, and found myself writing a book about them in my thirties and playing them again. It was amazed both by what I missed the first time around, and how differently I feel about certain games. I used to love two sports games for the original Nintendo—Blades of Steel, a hockey game, and Kings of the Beach, which is beach volleyball. I would play them for hours at a stretch. But when I played them again recently, it struck me how predictable and repetitive they are; I could only stomach them for maybe twenty minutes each. So, what I loved as a kid and what I love now are sometimes very different things. I have a sizeable collection of games—over two hundred for the Nintendo, one hundred for the Atari 2600, and a reasonable accumulation for several other systems, but for better or worse, I rarely take the time to play them. Still, I devoted days upon days to playing certain games back then, and I would still be willing to spend significant time on them today. For Nintendo: Kid Icarus, Cobra Triangle, Mike Tyson’s Punch-Out! !, R.C. Pro-Am, and all three Super Mario Bros.
For PC: Master of Orion, Wizardry, Populous, and The Incredible Machine. 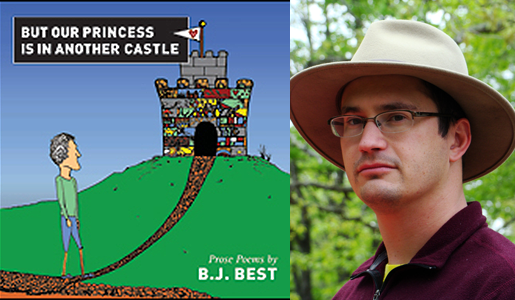 Purchase a copy of But Our Princess is in Another Castle here, & read more from / about B. J. Best here. J. A. Tyler’s novel The Zoo, a Going is forthcoming from Dzanc Books. He also runs Mud Luscious Press.